John Chisholm had a dream – to build a superior racing facility in his hometown of Antigonish. Riverside Speedway opened 1969 and quickly became known as one of the premiere race tracks in the country. In 1972 Chisholm climbed behind the wheel of his own race car and was a top modifed racer at Riverside driving cars built by Bobby Allison, Holman Moody, and Ed Howe. Until then most race cars driven in the Maritimes were home-built. He ran the first Export “A” NASCAR race at Ontario’s Cayuga International Speedway. In 1975 he hosted the Export “A” NASCAR Series at Riverside – and brought in the reigning Daytona 500 winner, Benny Parsons, to drive his ’72 Chevelle. He raced until 1978. In 1989 he sold Riverside, buying it back in 2005. He rebuilt the facility in 2006 and continues to own and operate it today. 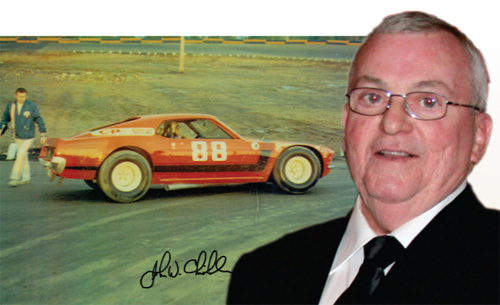 John Chisholm was inducted in the Maritime Motorsports Hall of Fame November 15, 2008. He passed away in July 2014 and, in 2015, was posthumously inducted to the Canadian Motorsports Hall of Fame.